First, I just want to wish my husband a very Happy Birthday! I'm very thankful for him and for how hard he works to support our family. He almost always goes along with all my design ideas and puts up with a lot of changing and rearranging. He didn't know what he was getting himself into when he married a creative person. :) Anyways, I asked him what kind of cupcakes he wanted for his birthday and he said he wasn't sure. So, I opened his eyes to the world of Pinterest. He never knew there were so many options for cupcakes out there. 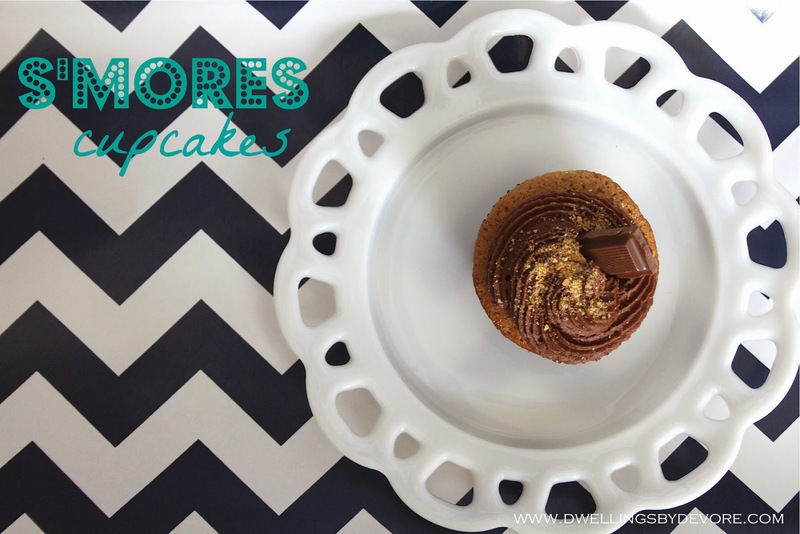 He finally decided on S'mores cupcakes after a few days of deliberating, it's a big decision you know. I searched through all the recipes on Pinterest and then some, but none of them were what I was looking for. He planned to take them to work so I needed something that would travel well. A lot of the cupcakes I encountered had a marshmallow type frosting and I was worried about how that would hold up if I made it the day before and it had to travel around a bit. Most of the reviews said it didn't do so well. So, I decided to combine a few different recipes to make a s'mores cupcake that would work for this occasion. I started with the cake. This recipe from Bon Appetit turned out to be a great base for my cupcake. Then, I wanted some sort of marshmallow filling to add the marshmallow component. I wanted to use this as a filling. Sure I could have bought marshmallow cream from the store, but I was feeling ambitious, probably a little too ambitious. So I turned to this recipe from Bright Eyed Baker. It really wasn't that difficult, just a little time consuming. It will make about twice as much as you need so you can just grab a spoon and eat it store the rest for later. Then I needed to throw some chocolate in there. I used this chocolate buttercream from Wilton. It's really easy and so good. For the cake recipe go here. For the marshmallow fluff go here. For the chocolate buttercream go here. 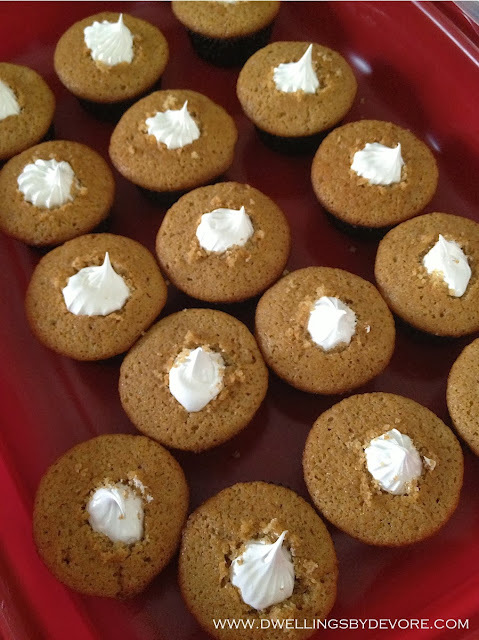 I used the marshmallow cream as a filling for the cupcakes. I just cut out a little chunk out of the top of each of the cupcakes. I piped it in, but you could also just use a spoon. It doesn't matter how it looks because it will get covered up with the frosting. It took me a good while to make these. Partially because I made a bit of a mess and had to clean it all up. I turned on a little Christmas music too (don't judge) which made it really fun! Here's to hoping they're a hit at the office today! Oy. It looks so good! Sometimes those are the best recipes. Go out there, find everything and pick from the best and combine! 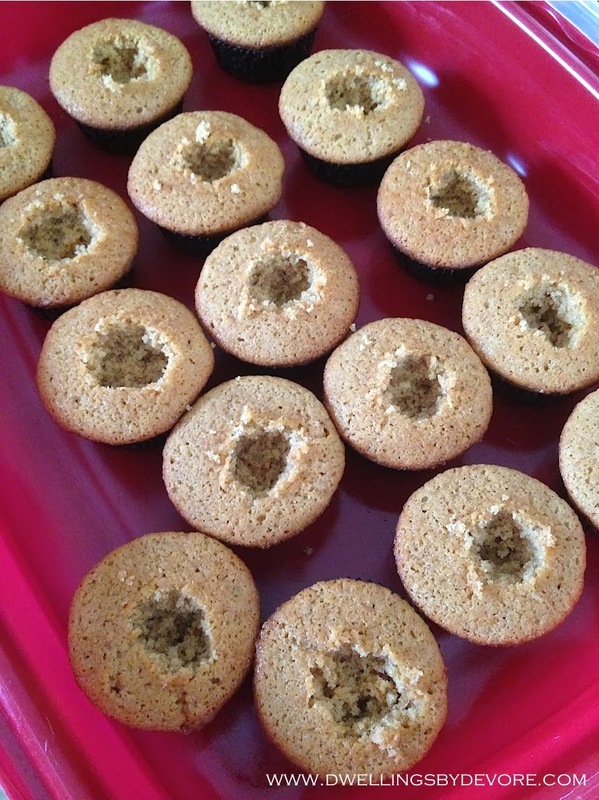 For my friend's shower I made little cups with graham cracker, a melted marshmallow and chocolate on top. Also from Pinterest lol but it was sooo good and now this has me thinking of that. Ay. Your hubs is a genius for picking this and you are awesome for making them. These are on my list for the holidays for sure! I bet they're going to be a huge hit! I'm always looking for a great chocolate frosting recipe, so I know I'll be trying this out! I need to clean the drool off my keyboard!! Yummmmm!! I'd be a happy girl with homemade marshmallow fluff ~ yum!! Have a fun celebration! They look delicious! How can you go wrong with butter cream and marshmallow fluff! Totally pinning this ~ how yummy! Thanks so much Anneke! They were really yummy! It's a really good, easy icing recipe! It's pretty much my "go to" for chocolate icing. They were really good so it made it worth the effort! They are definitely a good holiday treat! Pinning! Looks KILLER! Happy bday to your hubs! !